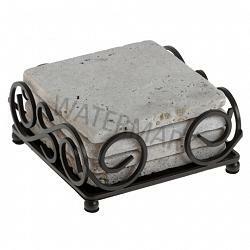 square coaster holder with wrought iron scrolls makes quite an impression to display your wildlife coasters. (coasters not included). This coaster holder design is simple and elegant. Fitting for every decor whether it is formal or rustic, this works. Inner dimensions are 4 1/4 in. x 4 1/4 in. 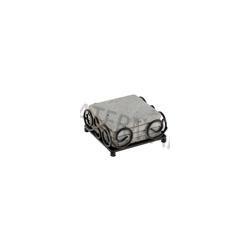 Holds 4- 4 in. x 4 in. coasters very nicely.